It’s been almost 7 years since I created this blog to share my experiences with others and teach those who wanted to try new things the best ways to get started. Many of you know that this blog is about my passions and is not my means of support, so rather than trying to sell ad space at fixed prices I’m going to make it very easy, Make me an offer! You see a spot you think might work for your product, make an offer! If you sell a product that I like to use, offer some samples or demos and we’ll work something out. You are an outfitter and want to post an article about your business or want to post a banner, offer to take me out! It’s that simple! Obviously, the longer or better offer takes precedence. The following information on this page is still relevant but disregard the ad prices, just don’t insult me with silly offers. 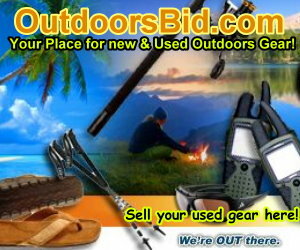 TheOutdoorsGuy.com receives over 15,000 monthly page views. In addition to direct traffic our reach through our Twitter accounts and Facebook is approximately 75,000 followers and growing. Equipment review articles will be mentioned in our tweets and Facebook posts. We will discuss paid tweet advertising for certain companies. THEOUTDOORSGUY is now offering various sizes of display banner advertising directly to vendors, as well as innovative branding and partnership opportunities such as sponsorship, display banners, product placement, and review articles to fit any budget. Please refer to the accompanying image when requesting pricing and banner or video placement. Click here to ask about ad availability. TheOutdoorsguy.com is an outdoors blog dedicated to those individuals who live for their time in the outdoors and are looking for information on outdoor activities and products. It is becoming known as the ultimate resource for all things outdoors and has grown in to several separate sections which reflects the site and its readers as a whole. The content covered in TheOutdoorsguy.com covers Tips, stories, equipment reviews, travel destinations and much, much more. Our audience is highly educated, affluent, and geographically concentrated around large metropolitan areas. They are interested in new products and destinations that make their leisure activities more exciting, and do not mind paying a bit more for a product if they are convinced it is of superior quality. If you feel you identify as a brand that especially appeals to TheOutdoorsGuy.com reader, we will be excited to extend you the opportunity to get in on the ground floor of our new private advertising project. For more information on specifications of advertising and prices, Contact Us so that I can hold your spot. I will need to approve all of your artwork and receive full payment before your ad appears. Please check our media page as we are now being called upon by various Radio and Televison shows to voice our expert opinions on all things outdoors. Thank you for your interest in THEOUTDOORSGUY.com.